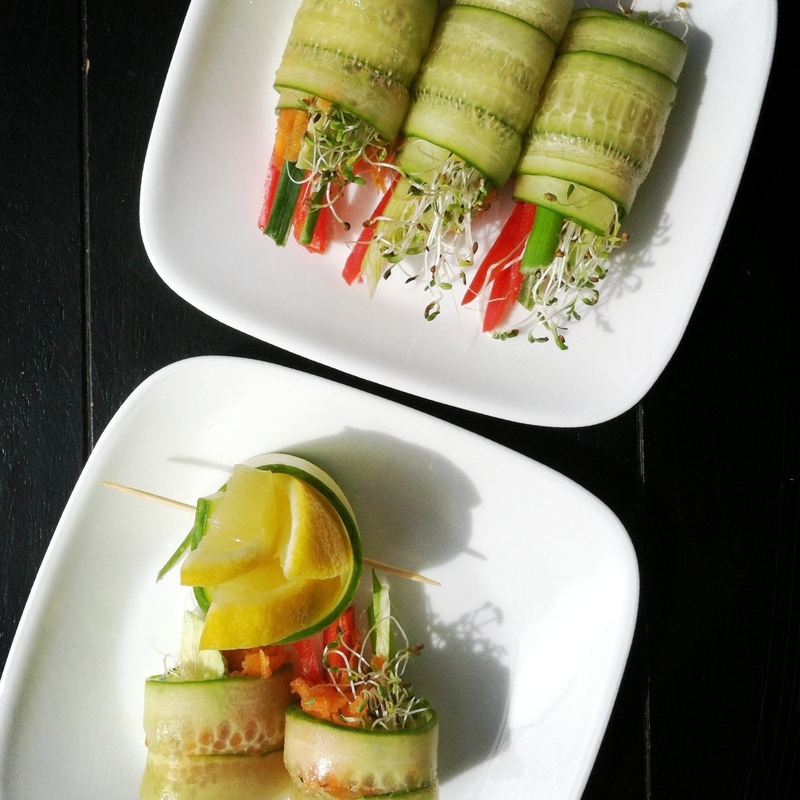 Raw Wraps (for the millionth time). | Eat More Plants. I cannot stress enough how much I love raw wraps. They’re so simple, you don’t need a recipe and you don’t ever have to make the same one twice (unless you want to of course). I had a green smoothie for breakfast so I was craving some crunch. I used my mandolin to make thin slices out of a European cucumber, unpeeled because it was organic. I laid two slices parallel to each other and overlapping halfway, just to create a larger surface. 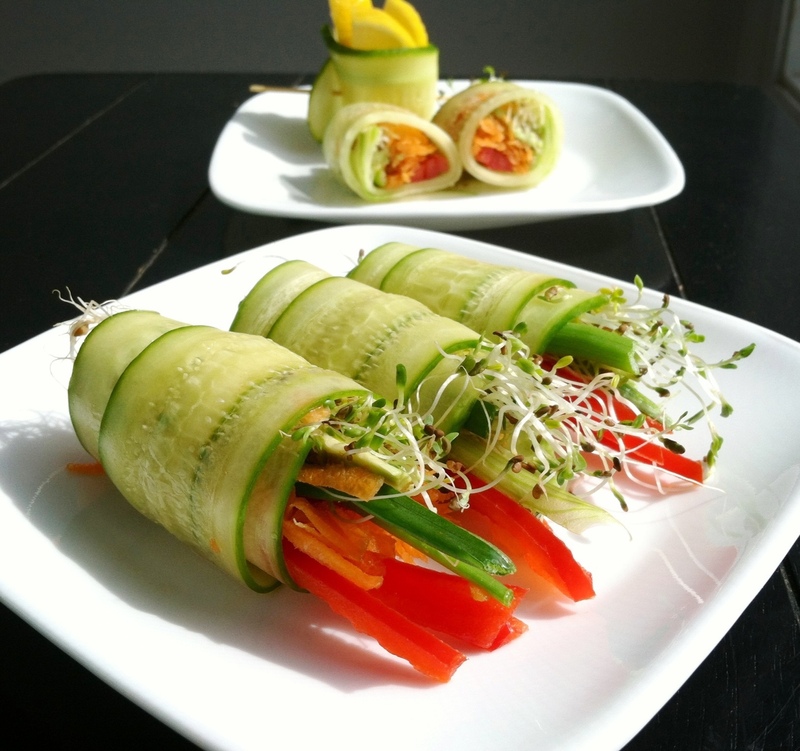 I put grated carrots, avocado slices, red bell pepper strips, broccoli sprouts and thinly sliced scallion at the thicker end and tightly rolled it up. Use a toothpick if your roll won’t stay shut but they should be wet enough to hold. I used some Bragg’s and lemon for dipping. Simple. Don’t be afraid to stray from what I did. You can use ANYTHING! Bean sprouts, grated beets, tomato, zucchini, snap peas, spinach, kale, asparagus, lettuce, bok choy, jicama…the list goes on. 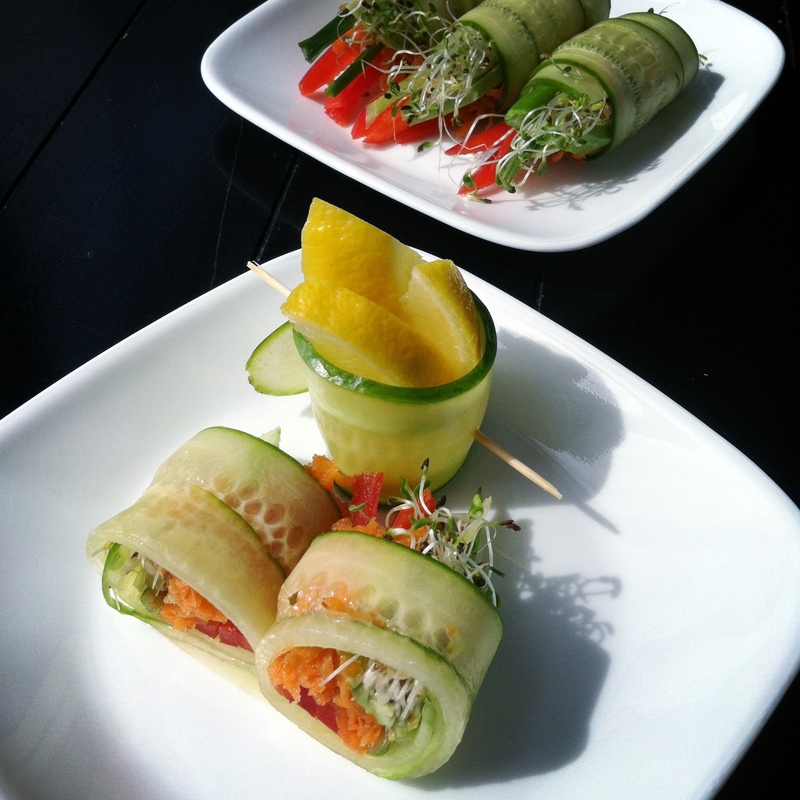 You can also use very thinly sliced jicama, kale, swiss chard, collard greens, nori or cabbage as your wrap. I think putting a pate in there would be nicer than just plopping the veggies in. What do you think? Miso carrot pate sounds delectable. I see now, I guess I missed the avocado part! I love this idea! My kids would love this for lunch. Oh definitely! My daughter eats these but I usually put some cream cheese in there. Cream cheese & edemame is her favorite!